← How Will I Look Old? But whoever was driving it is surely a kindred spirit. A big thank you to Gary for taking this picture for me. If you did not read last week’s post about my experience on the Cross Bronx Expressway you cannot fully appreciate why this is so funny. Although on it’s own it is pretty damn funny. I particularly like the steaming illustration. My brother should love this! 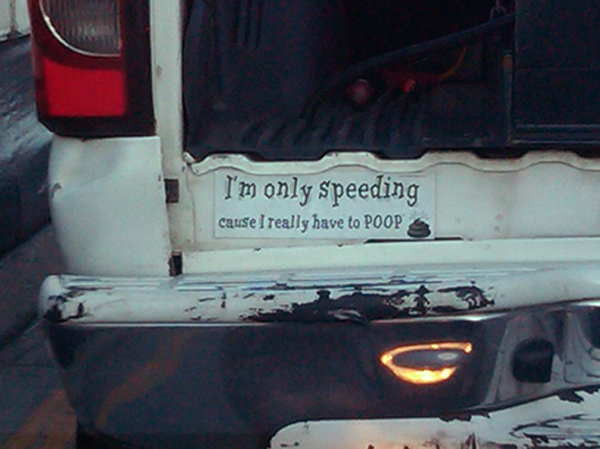 Hmmm, I wonder where I can buy this bumper sticker. It would make such a lovely gift. Silly me, all you have to do is google it… if you are interested, you can buy it here. Wait you guys, I don’t want to wake up and come outside to find this on my bumper, ok? Just want to make that clear. Oh, too funny, both posts! I’ve been stuck on the CBE, no fun. And having to pee when you’re stuck? That’s when I wish I was a guy, traveling with a jar like I’ve heard some guys do…. Btw, never ever take the Cross Bronx, unless there is absolutely no other way to get some place. Hysterical – but I DID use this as an excuse with a cop on the highway to Wisconsin once a few yrs. back and he felt so badly for me that he only issued a warning! ha! I DID ask him with a pained (I’m holding it) expression where the next gas station was!